Anyone fascinated by nineteenth-century American history and the westward expansion will enjoy Guerilla Bride. 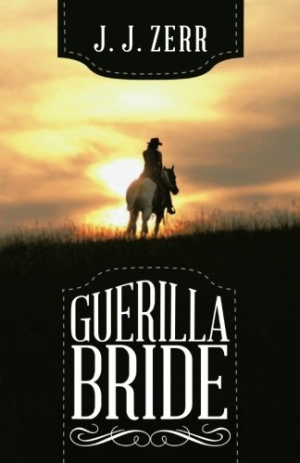 J. J. Zerr’s Guerilla Bride is a historical adventure headed by a complicated young man; it is reminiscent of Huck Finn, but with a six-gun odyssey. Emerson sets out for the West in 1860, pursued by a neighbor girl’s two brothers. They are angry at Emerson for “ruining” coquettish Candace during a moonlight tryst. His chances of marrying Deborah, whose family farm his father hopes to take over, are spoiled, so he is put on horseback and sent out of harm’s way. For the next few years, Emerson travels from Detroit to New Orleans, mostly in the company of Daley, a gentleman gambler. A card game goes sour in Missouri; his companion dies, and Emerson escapes again with the help of a bushwhacker, Ewing. What follows is a whirlwind of Dragoon and Colt pocket pistol adventures in Little Dixie, or the Missouri River Valley area stretching from Kansas City to Columbia. The narrative gallops along, pausing to deliver anecdotes about farm life, river crossings, ambushes, murder, and the kindness of common folk and their freed black companions. There are a few anachronisms, but this is still an uncommonly good story that is uncommonly well told. Emerson is a realistic character, especially as he turns from rough-edged farm boy into a presentable young gentleman under Daley’s tutelage. His moral depth is explored through who he’s willing to draw down on, with his left-behind churchgoing mother always seeming to look over his shoulder. A Quantrill Raider villain is sketched too lightly but functions in the text to convince Emerson that he has no particular passion for the North or the South, or for organized violence; his actions present Emerson with heady moral conundrums. Supporting characters fit tropes but are perfectly slotted into the narrative, especially Daley and Ewing, who’s a less-than-bloodthirsty guerrilla and a brave and loyal friend. Two women are central in Emerson’s growing maturity, and are well fleshed out; they are former saloon girl Molly Malone and Amanda, the sharp-tongued daughter of a Missouri horse rancher. Anyone fascinated by nineteenth-century American history and the westward expansion will enjoy Guerilla Bride, an adventure that chronicles the Civil War’s bloody whirlwind across Missouri.